It begins in 2008. The days of the strong man will return. First in Russia, Time Magazine’s “Man of the Year” for 2007, President Vladimir Putin, will step down from his office this March to play prime minister puppet master pulling the strings of his close confidant and chosen heir Dimitry Medvedev. The Punch and Judy puppet show — or I should say “Punch and Putin” show — will last four years. Then Putin is allowed by the Russian Constitution to do what Bill Clinton can only dream, legally run for election for a third and fourth term. The increasingly relentless strains of climate change, overpopulation, famine, economic troubles and energy shortages will find democracies ill equipped to move decisively towards solutions. Episodes of socio-economic breakdown are at hand. As I explained in further detail in Chapter One of my new eBook Predictions for 2008, we have already passed the “tilt” moment in climate change. In a world slipping into chaos the consensus legislating democracies — even the American — could find it necessary to invoke emergency rule or martial law just to keep the flow going of food, water and petroleum that sustain a developed society’s basic needs. The unprecedented powers surrendered to the presidency by George W. Bush because of his War on Terrorism will not be easily returned to Congress. You will by necessity see ever more powerful and dictatorial executive presidential branches in the coming decade. Democracy could become Plutocracy: government by rule of a wealthy, dictatorial elite. You will perhaps even hear yourself in a few years time publicly question whether democracy can function in a perpetual state of national emergency. In the early days of the Roman Republic (458 b.c.e. ), when the Senate faced the threat of an invasion of the Italian tribe of the Aequians of Umbria, who had ambushed and massacred a Roman army, they concluded that, for the duration of the emergency there was no time to waste in debating and finding consensus and compromise. They took a risk. They chose to take orders from one of their number and appointed Senator Lucius Cincinnatus, Dictator of Rome for a six-month term. With autocratic power in his hands, Cincinnatus quickly ordered all males of Roman Latium of fighting age to gather and be invested in a new Roman army that surprised and decimated the invading Aequian force. Afterwards, he did not march on Rome with his victorious army like dictator Triumvirs, such as Julius Caesar or Octavian would do centuries hence. 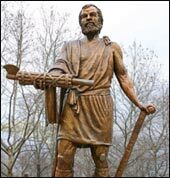 Cincinnatus, as portrayed in the statue above, surrendered the Roman fasces — the symbol of his dictatorial power and the root of the word “fascist” — back to the Republican Senate, not more than 15 days into his 6 month term as dictator. Then he retired to his farm and his beloved plow. We get the word and the definition of “citizen” from his name and his democratic ethics. Tens of millions of citizens of America in the last Cosmic Day Cycle (1972 — 2008) sowed little to next-to-no citizen participation in their democracy. They bought the disconnect, thinking the government was some alien body, separated from their lives and participation. They bought that excuse and for decades copped out of voting or participating in their democracy to keep it vibrant and alive. People of talent avoided public service. Then came the carpetbaggers, the house of representative homies of Washington big business lobbies. Governance was left to lesser men and women of ill repute. For 36 years, more corruption and mediocrity ruled in the Capitol and White House until we come to it now, the harvest time and a new hunger for better governance and voter participation. If elections in 2008 do not change this course, and make a new beginning for American Democracy then the coming 36-year era of Cosmic Night will reap a bitter harvest of freedom in decline, taken for granted — lost! When these systems break down the very people who talk freedom but live licentiously will talk “order” and “security” at freedom’s cost. People who call themselves liberals today will seek stability over the chaos of freedom. It is best now to understand why that could be so and strive in the political debate to turn a future towards a new era of unprecedented citizen participation in the peaceful defense of their freedoms from enemies more domestic than foreign. The country must begin moving away from the sharp edges of its political extremes and find a balance. Freedom becomes chaos in our times because people have a deep and programmed misunderstanding of Freedom as some kind of entitlement. Freedom without responsibility is a bird flying with one wing, sure to crash. This entry was posted in Election 2008, Geo Politics and tagged 2008 election, Aequians, Aequians of Umbria, Cincinnatus, Cosmic Day Cycle, democracy, George W. Bush, Hogue, John Hogue, Julius Caesar, Medvedev, Nostradamus, plutocracy, predicitons for 2008, predictions, prophecies, prophecy, prophet, Punch and Judy, Roman Republic, Triumvir, War on Terrorism. Bookmark the permalink. Post a comment or leave a trackback: Trackback URL.